Maintain a defensible space around the house of up to 5 feet from the outer perimeter. This area should be filled with noncombustible materials like gravel, brick, or concrete. If possible, allow up to 6 inches of clearance made of noncombustible material from the ground to the bottom row of siding. Measure another 25 feet beyond the 5-foot clearance, then remove shrubs, trim the trees and remove dead vegetation. Clear the area around the house of combustible material, such as paper debris, stored fuel and scrap wood. Do the same vertically by removing leaves and debris from the roof and gutters. In the event that wind blows embers and ash in your home’s direction, make sure the eaves and vents are protected with mesh made of aluminum or some other noncombustible material. Have HVAC repair and maintenance performed by a professional to ensure you have efficient air circulation inside. Deck — Untreated wood is vulnerable to fire damage. Consider metal or fiber cement decking for your next deck replacement. Make sure the patio covers, as well as the patio furniture, are made of fire-retardant material. Siding — Fiber cement siding is your best bet for protection against fire damage. There are fiber cement siding options that can match the look of your existing siding. If you currently have wood shake siding, you shouldn’t worry about having to completely change your home’s looks. Roof — Metal, tile and slate are roofing options with the best fire rating. If you must have asphalt shingles, check and make sure they’re tested for fire resistance. GAF offers products designed with Advanced Protection® Shingle Technology, as well as components like the VersaShield® underlayment. 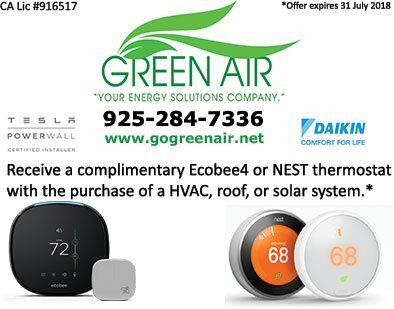 To learn more about improving your home’s fire resistance, or if you have inquiries about products such as a smart HVAC system, call Green Air Heating and Air Conditioning, Inc. today at (925) 284-7336. You can also fill out our contact form to schedule an appointment. We serve Concord, CA, and the other nearby areas in California.